More Than Just A Part In Your Project! Thanks to all our fans and followers who have been participating in our Facebook photo competition ‘More than just a part in your project’. We’ve received an overwhelmingly large number of entrants and seen some fantastic pics of restoration projects and enviable daily drives. At the end of each fortnight, the top three photos that have received the most likes, win a Rare Spares voucher or a mystery prize. We’ll also be giving away a prize to one lucky person who has liked one of the photos, as well as a $200 Rare Spares voucher to the photo with the most likes overall at the end of the competition! 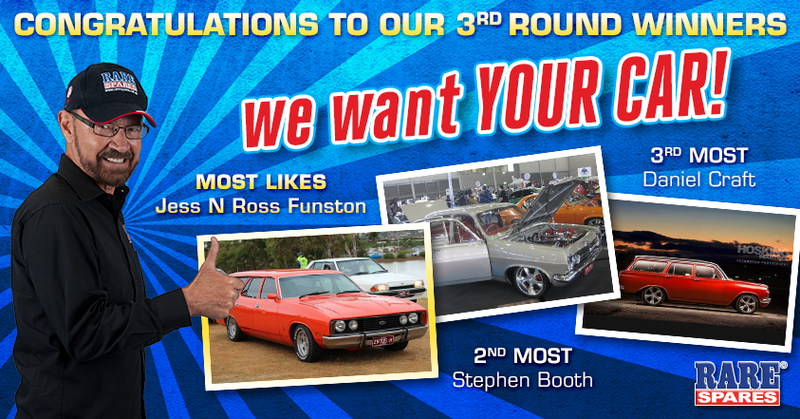 Round three prizes went to Jess and Ross Funston in first place, Stephen Booth in second and Daniel Craft in third. The competition is running for 3 more weeks, so keep them coming! We want your car!